Hands can grab things, build things, communicate, and we control them intuitively with nothing more than a thought. To those who miss a hand, a prosthesis can be a life-changing tool for carrying out daily tasks. 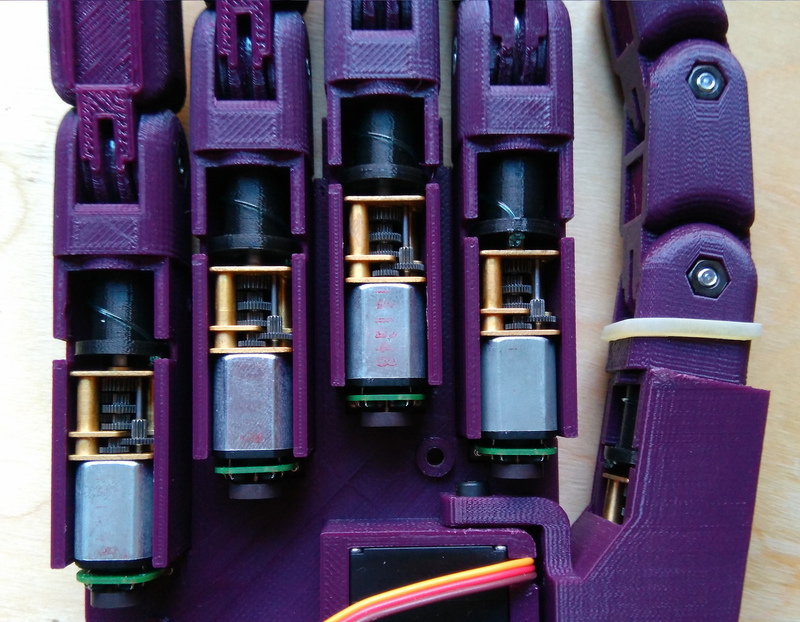 We are delighted to see that [Alvaro Villoslada] joined the Hackaday Prize with his contribution to advanced prosthesis technology: Dextra, the open-source myoelectric hand prosthesis. Dextra is an advanced robotic hand, with 4 independently actuated fingers and a thumb with an additional degree of freedom. Because Dextra is designed as a self-contained unit, all actuators had to be embedded into the hand. [Alvaro] achieved the necessary level of miniaturization with five tiny winches, driven by micro gear motors. Each of them pulls a tendon that actuates the corresponding finger. Magnetic encoders on the motor shafts provide position feedback to a Teensy 3.1, which orchestrates all the fingers. The rotational axis of the thumb is actuated by a small RC servo. In addition to the robotic hand, [Alvaro] is developing his own electromyographic (EMG) interface, the Mumai, which allows a user to control a robotic prosthesis through tiny muscle contractions in the residual limb. Just like Dextra, Mumai is open-source. It consists of a pair of skin electrodes and an acquisition board. The electrodes are attached to the muscle, and the acquisition board translates the electrical activity of the muscle into an analog voltage. This raw EMG signal is then sampled and analyzed by a microcontroller, such as the ESP8266. 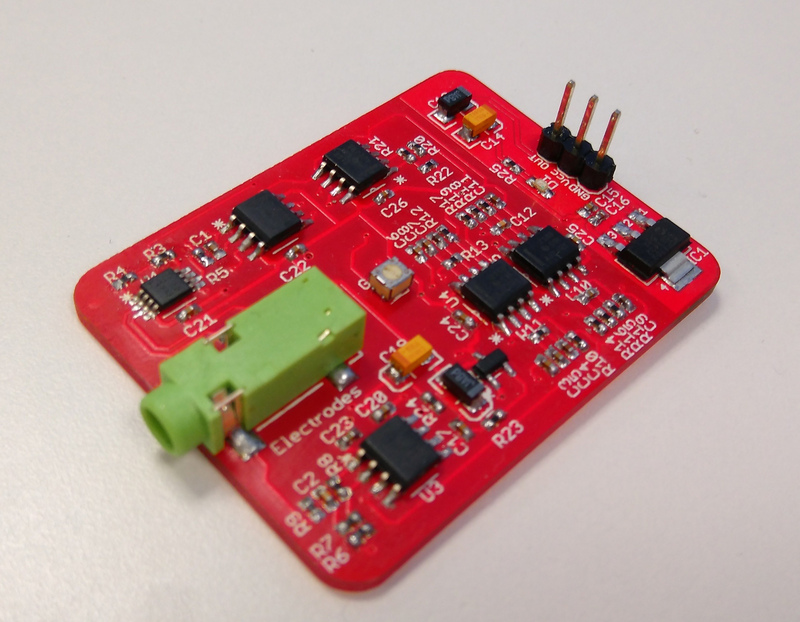 The microcontroller then determines the intent of the user based on pattern recognition. Eventually this control data is used to control a robotic prosthesis, such as the Dextra. The current progress of both projects is impressive. You can check out a video of Dextra below. In this day and age we’re consistently surrounded with portable electronic devices. In order for them to be called “portable”, they must run on batteries. Most, if not all, use rechargeable batteries. These batteries have a finite lifespan, and will eventually need to be replaced. UCI chemist [Reginald Penner] and doctoral candidate [Mya Le Thai] have been hard at work on making rechargeable batteries that last forever. Nanowires are great candidates for rechargeable battery technology because the wires, thousands of times thinner than a human hair, are great conductors of electricity. The problem is repeated charging and discharging makes them brittle, which causes them to eventually fail. Typically, the researchers at UCI could get 5000 to 7000 cycles in before they failed. After some trial and error, they found that if they coat a gold nanowire with an acrylic-like gel, they can get up to 200,000 charge/discharge cycles through it before failure. We’ve seen rechargeable battery hacks before, but making a battery that never needs replacing is sure to get everyone excited. Crystal radios are old news, but great fun. What would happen if a PhD designed a crystal set? By PhD we mean Pizza Hut Deliveryperson and [John Greenlee] (who may not actually be a PhD of either kind; we don’t know) gives us a good idea with his crystal radio in a pizza box. Pizza boxes aren’t the only food-related material in this radio. [John] makes a tuning capacitor out of cake rounds. Coincidentally, he decorates the tuning capacitor to look like a pizza. The schematic itself is unremarkable–just a common crystal set. But the construction of the chassis and the capacitor make it an interesting project. If you know a young person that has any interest in radio, a crystal receiver is a rite of passage you shouldn’t deny them and this one is certainly a novelty. The picture of a pizza takes it even one step further than this YouTube build, which is nonetheless a good resource. The instructions are well done, although some of the parts may be slightly hard to find. Germanium diodes and high-Z earphones are not as plentiful as they used to be, although you can still find them if you look. This pizza box rig could be a gateway drug to more serious crystal radios. Or you could go smaller and try building one in a match box. 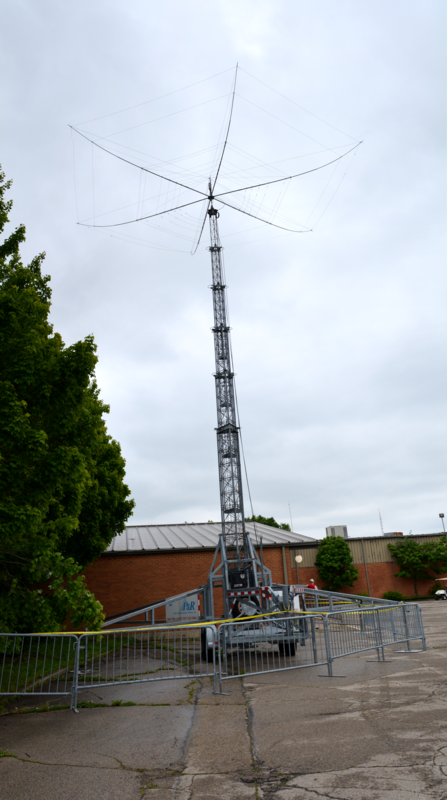 Last weekend was Hamvention, the place you want to be on the third weekend in May. It is the world’s largest gathering of amateur radio enthusiasts, and an exceedingly large flea market containing all sorts of electronica. The booths of Hamvention include a few notable Open Hardware folk, but for the most part, you’re looking a few big booths from Yaesu, an entire section dedicated to everything ARRL, and a few pop-ups from the usual suspects. Rigol was there, showing off their test equipment and selling the DS1052E oscilloscope for far more than it’s worth. The Rigol Zed is a much better buy, anyway. As with any gathering of hams, antennas are everywhere. The largest by far was the tower at right. With a little more equipment, this antenna could do a moon bounce. It’s a shame the moon was full this weekend, and everyone went to bed early. Giant antennas and an amateur radio trade show notwithstanding, the biggest draw is the flea market. You’re looking at about two football fields worth of parking spaces, filled with cars, tents, and collapsible tables and the strangest electronic devices you’ve ever seen. What was that like? Read on below.